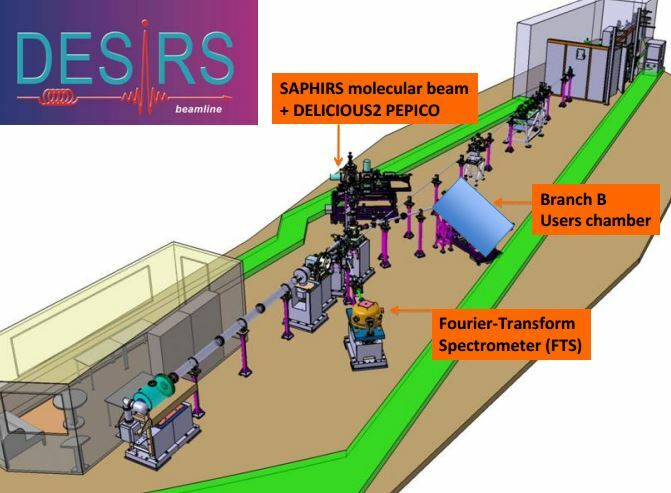 DESIRS (Dichroïsme Et Spectroscopie par Interaction avec le Rayonnement Synchrotron) est une ligne de lumière à onduleur, couvrant la gamme du VUV (5-40 eV) et offrant une combinaison unique d’ultra-haute résolution, pureté spectrale, flux et polarisation totalement ajustable. 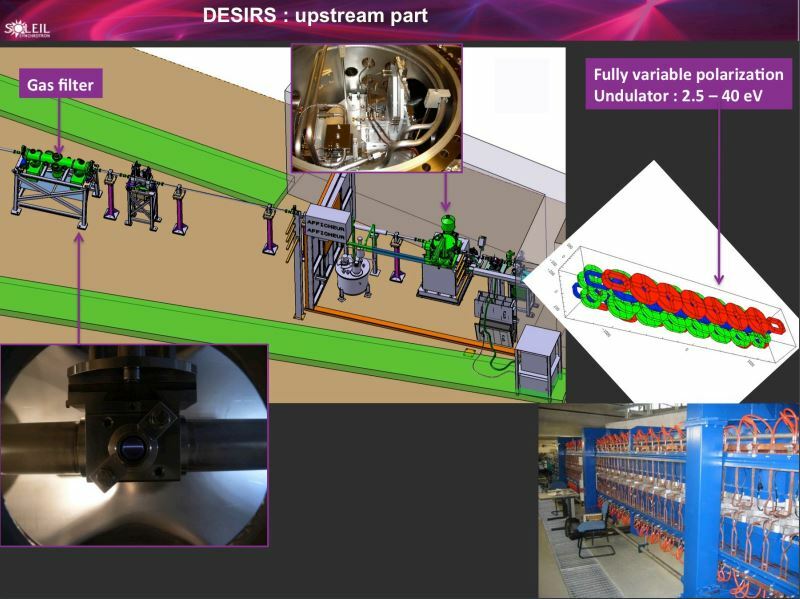 DESIRS (Dichroïsme Et Spectroscopie par Interaction avec le Rayonnement Synchrotron) is an undulator-based beamline covering the VUV range (5-40 eV) with a unique combination of ultra high resolution spectral purity, flux and fully variable polarization. 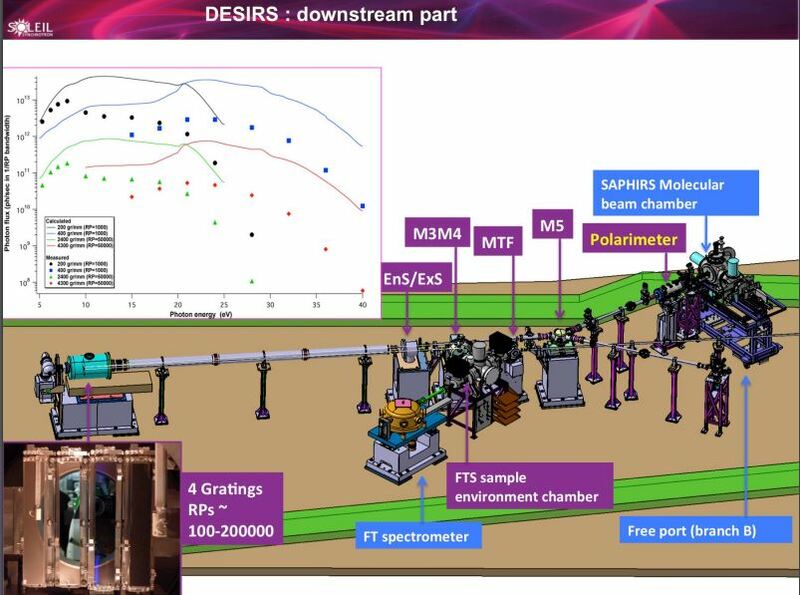 DESIRS provides new opportunities for the study of photon-induced processes via the valence shell on mainly isolated gas phase samples, such as cold molecules, radicals, laser-excited species, biomolecules, large ionic biopolymers, clusters and nanoparticles, as well as on condensed matter. This includes high resolution spectroscopy, molecular dynamics and reactivity, and photoionization dynamics studies. 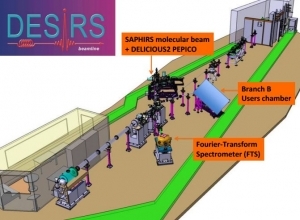 In addition, the availability of calibrated versatile (linear, circular) polarisations of the photon beam is a unique specificity of the beamline allowing the study of molecular chirality and anisotropic properties of matter via different types of dichroism experiments. Note also that the research carried out on DESIRS takes place within the framework of the “Gas phase, atmosphere, universe” scientific section of SOLEIL. Fully-harmonics-free radiation owing to a gas filter (up to 21 eV) and optics cut-off above 21 eV. Circular Dichroism in the photoionization of anisotropic samples, including chiral molecules, complexes and clusters (PECD). very-high resolution spectroscopy and photon-induced dynamics on small molecular systems. Comparison with satellite- spectrometer data. Photo-chemical effects of CPL onto chiral species : enantioselective photolysis and asymmetric synthesis. Link to biomolecular asymmetry. Spectroscopy (excitation and relaxation) of luminescent solids and of molecular liquids. 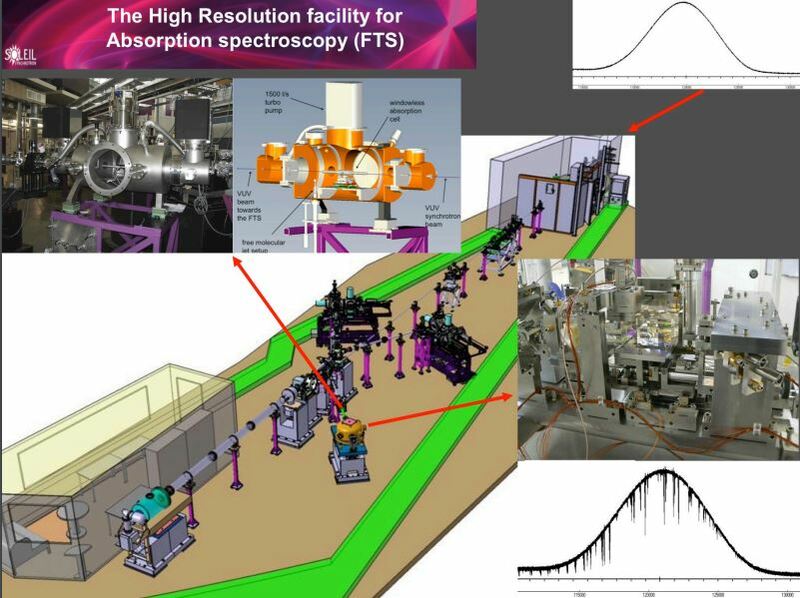 The beamline possesses 3 different branches and 2 endstations available for users. several windowed absorption cells of various lengths for absolute cross sections measurement and/or high column densities. One of them is equipped with a DC discharge for the production of radicals. a free molecular beam (rotational cooling down to 20 K column density up to 1015 cm-2). 2 monochromatized branches (Branch A and B) : to perform any type of spectroscopy or dichroism experiments with an optimized resolution/flux compromise ensured by the use of 4 gratings (4300 gr/mm, 2400 gr/mm, 400 gr/mm and 200 gr/mm) (typically 1010-1011ph/sec for RP of 100000 up to 1013-1014 ph/sec for a RP of 100), and variable polarization (linear horizontal, vertical as well as left- and right-handed circular polarization mode (CPL) fully calibrated owing to a VUV polarimeter (1.23 Mo). In the pure CPL mode, the absolute polarization rate, as measured at the sample location, is above 97 % over the whole VUV range. a simple nozzle for gaseous samples, or highly-volatile liquid ones introduced via a cooled or heated bubbler. A recently-added differentially-pumped double skimmer chamber described in this publication (2.89 Mo) that can be aligned in-vacuum, has increased the maximum working pressure in the main source chamber to a few torrs. In addition, the double skimmer has narrowed the molecular beam profile so that the particle kinetic energy resolution has been improved, as well as the cation mass resolution, which has been multiplied by x1.5.